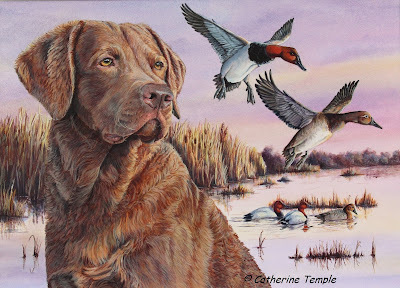 Catherine Temple is a wildlife and pet portrait artist residing in Eastern Washington. She is within easy reach of scenic mountains, beautiful rivers and diverse wildlife and when not in her studio she can be found exploring this wondrous area with sketchbook and camera searching for the subject of her next painting. That subject could be one of the many bird species common to the area, big game animals or the loving, domestic companions that share the lives of so many of us. Catherine developed her love of art and animals as a child growing up in rural Illinois on her family’s farm/game farm. Her father had a passion for raising exotic animals such as flamingos and sika deer in the backyard alongside the more common cows and chickens, giving her ample opportunity to study and draw a variety of animals first hand. As an adult she continued practicing her art and improving her skills by studying biology and taxidermy to better understand the anatomy of the birds and animals she loved to paint. When she and her husband acquired their first hunting dog, a Chesapeake Bay Retriever named Jake, a deep bond was formed between the two. Inspired by this bond she shared with her pet, she painted his portrait and soon discovered there were others that loved their pets as much as she did. This opened up a whole new direction for her art and she has since created dozens of portraits for pet owners all across the country. Catherine prefers to create her paintings with water media (acrylic, watercolor and gouache) or graphite in a realistic manner. She usually keeps the backgrounds subtle and focuses the detail on the bird or animal she’s painting. The eyes are almost always completed first as she believes this brings the spirit and character of the animal to life and this is usually what people viewing her paintings comment on first, that the eyes capture and hold their attention. Catherine is the 2017/2018 winner of the Delaware Duck Stamp contest. Her art has been included in both solo and group shows and her portraits and bird art are in numerous private collections across the country. Her artwork can be viewed at www.catherinetemple.com.